Fritz was found stray on the streets of Central Texas. It's a miracle he was found safe and unharmed as he is blind. He must be one smart boy to have made his way unharmed. A vet has looked at his eyes and they don't believe the eye condition is correctable but Fritz doesn't seem to mind. He is not fearful at all and is so accepting of whatever comes his way. 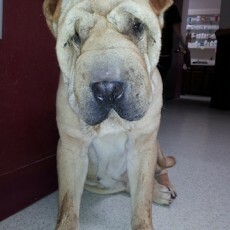 He was covered in fleas when found and he was very good for his bath and really seemed to love the gentle hands on him. 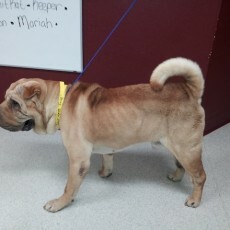 At 2-3 years old, he has a lot of life ahead of him and will make someone a wonderful companion. 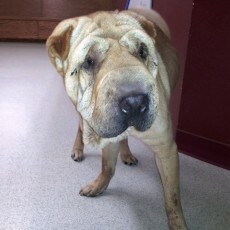 He is good with everyone human and canine, so please consider opening your home to this very special Shar-Pei. Update: Sometimes rescue is nothing more than giving them a few days or weeks of love and care before they leave this earth. 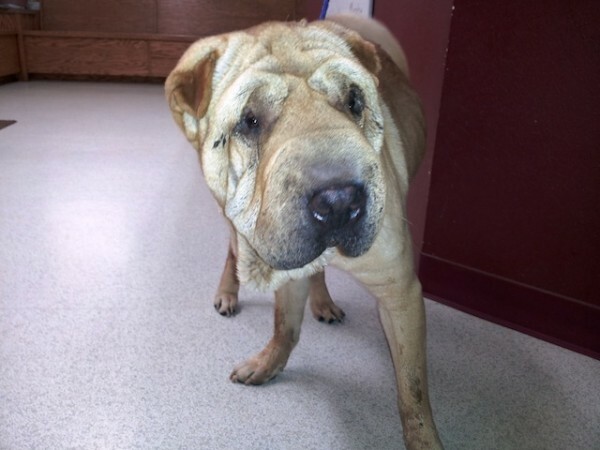 We were so saddened to receive the call from our vet that Fritz had bloated during his stay at the vets office where he was getting ready to start his heartworm treatment. Unfortunately it happened very quickly with little warning and they were unable to save him. Rest in Peace sweet beautiful boy. Your NASPR family loved you.